What You'll Need: scriptures, GAK 222: Jesus Raising Lazarus from the Dead, GAK 213: Christ Healing a Blind Man, printed activity pages, brown yarn, scissors, hole punch, scotch tape, coloring tools. Scripture: John 2:23 - Now when he was in Jerusalem at the passover, in the feast day, many believed in his name, when they saw the miracles which he did..
Do you know what a MIRACLE is? 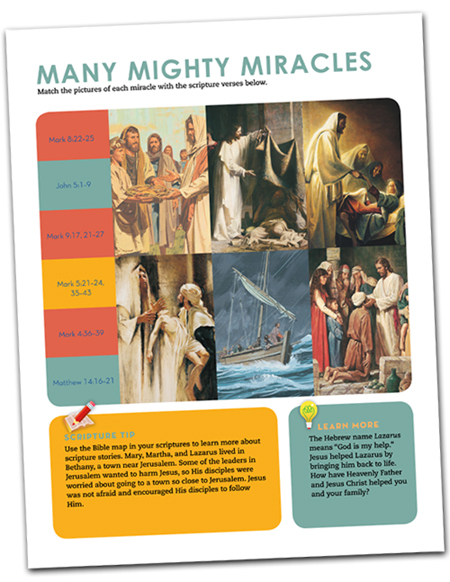 - a Miracle is an extraordinary event showing Heavenly Father's help in our lives. There are things we think are impossible, but the scriptures tell us that for Heavenly Father nothing is impossible. Heavenly Father can make miracles happen through His faithful servants on earth. 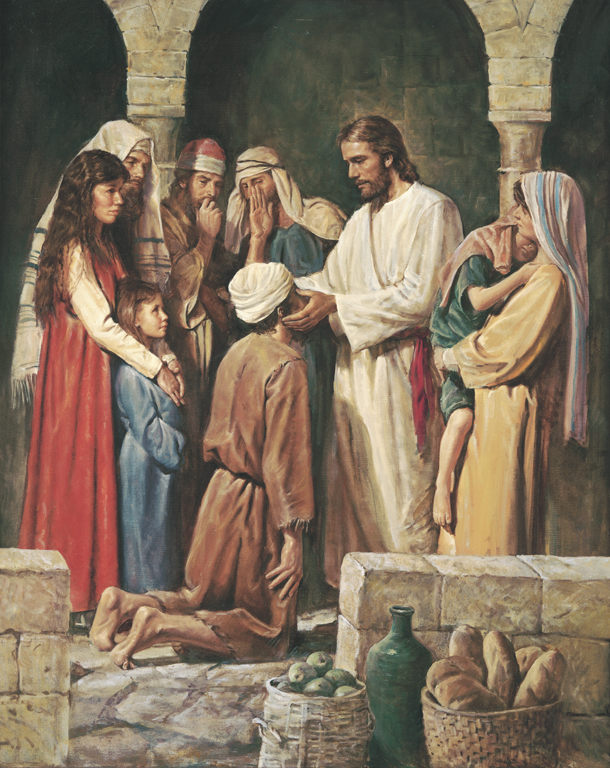 In 1 Nephi 7:12 we read that "...the Lord is able to do all things according to his will, for the children of men." When Jesus was on the earth he performed a lot of miracles. He performed miracles to many reasons. 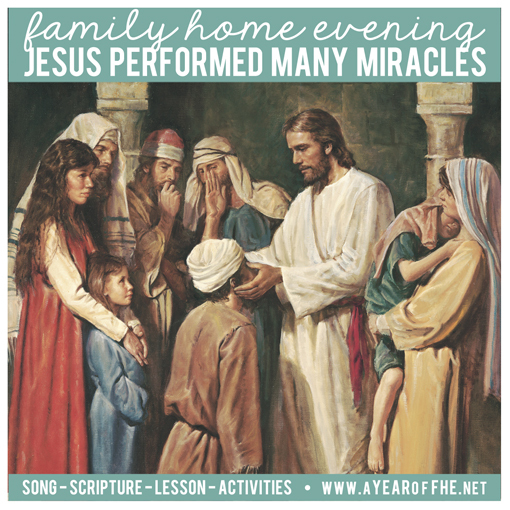 We are going to learn about just a few of the miracles Jesus performed. Once when Jesus was healing the sick there were so many people (5,000) who needed help that it took a very long time. It became late and the people were hungry. Help the children understand that this was a large number of people. Compare the people who were fed to a group of around five thousand people that is more familiar to the children (for example, “Jesus fed as many people as there are in our town”). A little boy was there who had a little bit of food, just 5 loaves of bread and two fish. Instead of sending the people away, Jesus blessed five loaves of bread and two fishes and miraculously was able to feed 5,000 people. When he was done feeding the people, there was enough food left over to fill 12 more baskets. On a Sabbath day Jesus saw a man who had been born blind. Jesus spat in the dirt and made clay, then put the clay on the blind man’s eyes and sent him to wash in the pool of Siloam. After doing as Jesus said, the man came away from the pool able to see. The man’s neighbors were amazed, and he explained to them how Jesus had healed him. The Pharisees claimed that Jesus was a sinner for having healed someone on the Sabbath. When the man who had been blind was asked what he thought about Jesus, he said Jesus was a prophet. Later, Jesus found the man and revealed that He was the Son of God. The healed man believed and worshiped Jesus. Lazarus and his sisters, Mary and Martha, were faithful followers of Jesus. Jesus loved them dearly. 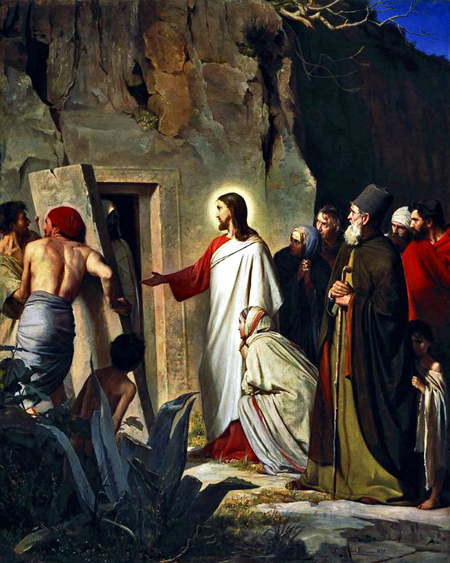 After hearing that Lazarus was very ill, Jesus went to them. By the time He arrived, Lazarus had been dead for four days. Jesus prayed to Heavenly Father, then commanded Lazarus to rise from the dead. Lazarus came back to life. Many people saw this miracle and believed in Jesus. We still see miracles in our lives today. They might not be as big as someone being raised from the dead, but our lives are filled with tiny miracles ever day. (Tell your children some miracles you have witnessed. This may include the miracle of birth, answered prayers, healing from sickness, Priesthood blessings or other spiritual experiences.) When we have faith in Jesus Christ, we can have miracles happen in our own lives. Bear your testimony about the power and divinity of Jesus Christ. Express gratitude for the miracles you have witnessed in your own life. Thanks for the lesson! For some reason, it never occured to me to start sharing miracles with my kids (2 and 1). But they will love this lesson-- I'm glad to find lessons that are actually more to their level BUT are also still good reminders for the hubby and me! Hi! 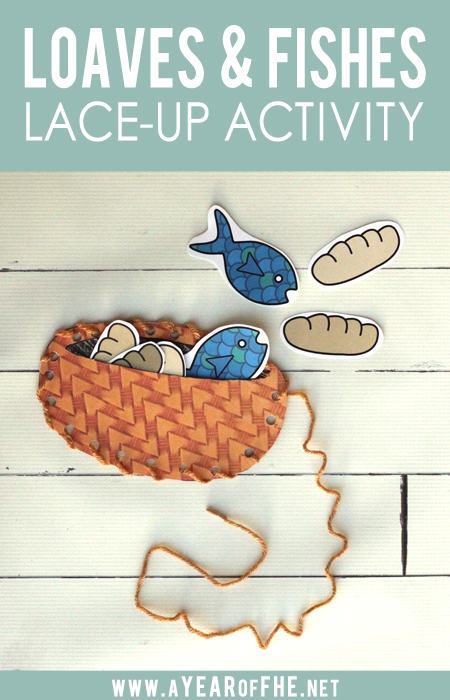 I just wanted to let you know that the link for the lace up activity just leads to the color actvity again! Thanks! Pamela..THANKS for letting me know. I fixed it! Thank you for the lesson. What a gift! Thank you...plan to use this for my 2nd grade ccd class! I tried to click on the lace-up activity and it went to the color page again. I like this activity for my mission trip. What great lesson plans and I love the visual aids. Thank you for all your time putting these together and your willingness to share them. Thank you SO much for sharing! God Bless you! Thank you for this lesson. I am glad that even though I am sick, that it will not be hard to have a lesson for my family. Thank you for your hard work, creativity, and generousity. Merry Christmas! This is a good activity to teach children to miracle of the 4000 and the 5000.